One Step Ahead is amazing! Seriously, they're amazing. Keep reading and you'll see one of the many reasons why. The products One Step Ahead makes are truly one-of-a-kind, multi-functional, sturdy, and well... like I said above, amazing! 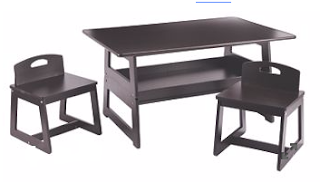 Take for example this Height Adjustable 2-in-1 Table & Chairs. It can be made into many different pieces of furniture, and used in many different ways. If you stack it, the two tables make an awesome kids' set, or family gaming table. This is definitely a table that can and will grow with the kids. If you separate it, you've got a pair of toddler tables, or even a coffee table for the living room. I think this would look great in a gaming room too, or for a busy parent who has to have a lot of things nearby fast, because it sits nice and low for easy reaching. The set includes two stylish and sturdy chairs that will hold up to 150 lbs. a piece. Assembly required. Recommended for ages 3 and up. Please Note: Since you are reading this post, please note that I am, courtesy of One Step Ahead, giving away a Multi-Function Table and Chair Set for kids (not this one, but one that does so many things too!). Head on over and enter! That set is incredible too! Visit One Step Ahead website to check out all of their amazing items. Believe me when I say, this is just one of many! You can also follow along on Facebook and/or Twitter. Now my question to you: How do you think you would first use this set in your home? This is a very nice looking table, and would be really handy for someone with small children. That's a great looking set. I love that you can adjust the height. That makes it perfect for adults and kids. I love adjustable piece of furniture like this. Great for family game night and great for entertaining too. NO WAY! It's about time someone thought of this. I am showing this to Chris right now because I want one - BAD! Really, really nice. Will put on my wishlist. Thanks for sharing! How cool is that? I love furniture that serves multiple purposes so this is right up my ally! This is very versatile. I think the Multi-Function Table and Chair Set is a wondrous set of furniture. I really like that table and chair set. What a smart design. I love this idea. I bet this would make a perfect kids table as well. A must have. I love the versatility of this table! I can see families getting a lot of use out of it! This could make a great addition to the house even after the kids grown older. It would be nice to be able to raise the table from coffee table height for specific occasions. That is awesome. So versatile and useful. What a useful table. My parents would love it. I checked out their website and they have a lot of cool stuff. I had never heard of them before now and I will definitely be checking back with them when I am ready to make a purchase. This table sounds like the perfect addition to any household!! Love that it is adjustable and very versatile!! How efficient and convenient! I love that it has chairs too, for the kids! What an awesome product, so many potential uses. My round coffee tables rises up and down, but it doesn't have those awesome chairs. I'm a little jealous. Love this! I think it makes a great coffee table. I'm picturing working on puzzles there! I'd love to get this table for my toddler. It looks like it would be a great piece of furniture to have for her. I learned it arrives fully assembled. Would be great for arts and crafts or playing games. Very unique and lots of uses! These are awesome. They would be so great for my kids. Our kitchen is so small, that we have to eat in the living/dining room, so this would be perfect for the kids. Also great to do projects and homework on. Thanks for sharing. That is such a neat table. I've actually been checking for a coffee table because the hubs gave his coffee table away before I got here. LOL. I love the design of that one. This is awesome! It would be perfect for my kids! I've been looking for a new set of tables and chairs! I love that this table is adjustable. I don't have a lot of space, so this table would be perfect. Oh I love this design! We need more multifunctional furniture in this house! That is so neat and I would love something like that. I would use it a lot. What a great way to save space but still have something useful for multiple things. Excellent product. What an attractive table! I love that it could be used in so many ways. I'm all about multi-purpose furniture! Wow, I love this. I really could have used them as my kids were growing up. I love how it morphs into multiple things! 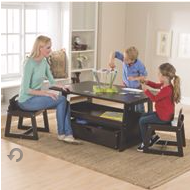 This looks like a very useful table as it appears comfortable for adults and kids. this is so cute. I would love this for our playroom. I have a small space and this table would be perfect. I will check this out. This can be very convenient indeed. I will have to share this with my sister who has younger kids along with my niece. This would be great for the kids. Thanks for sharing. What a neat idea! This would be perfect for smaller kids - like the idea of multi-purpose furniture. Smart! I love furniture that serves two purposes. It not only saves me money, it also saves a lot on space. Thanks for sharing! This is so cool and would come in handy in my small studio apartment when I need more space for seating. Thank you so much for the info and for sharing. I think a set of adjustable benches like this would be perfect for our house. Thanks for sharing this. It looks great! We often have family gatherings where the children sit at their own table; high chairs and booster type seats need to be used. This versatile furniture piece would be perfect to remedy this problem. I also favor the darker wood tones. I love furniture that is versatile like that. 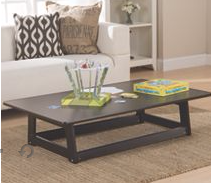 This would be great for turning the coffee table into a taller table for game night! LOVE furniture like this! The kids can have their own "kids table" and when they have outgrown it the table can become a coffee table. Great idea! What a great feature! We could put this table to use in several rooms. What a fun set to have. Durable pieces are always a good idea, especially if space is limited. This would make a great area for my kids to homeschool as well as an area to play and do crafts. It is a perfect size for my home. I've never seen those! How great is that! I love that it has chairs too, for the kids! This is such a versatile set! I absolutely love the coffee table look! This looks like a very useful set. I like multi-purpose furniture pieces because can be adapted to different spaces. This is SO smart, especially in small apartments. This would be great for my kids I think. I have always wanted a table like this! I think its awesome for smaller homes to maximize storage and space! I've always wondered why furniture isn't more adaptable! People come in all shapes and sizes! Nice table and chairs...I love the fact that it is adjustable. Such a good idea - this would be perfect for my family room! These table & chairs look really great! Love that the furniture is adaptable. What a great idea! I know that the ability to change its height would allow us more use. I need to check out their other products. That is a very nice table. The way it is adaptable makes it so useful! This is just a genius idea! Especially for my family, where we have such limited space. This might very well be the most stylish "kids furniture I have ever seen. Of course, with the weight limit, adults can use it too. This would be perfect for dinner parties. Adults at the dining table , kids at this one. How neat! I have a coffee table that lets you pull the top portion up to sitting height, and I freaking LOVE it for blogging and such. This would be so great to have as an option too! That is very versatile and could so work for years - loev it! This is a fantastic table. I would love to have one for my living room. The chairs would be perfect for the kids. This so incredibly cool! I would love this in our home! Omg! These chairs would come in handy in my house!! We are always sitting in our knees at the coffee table! 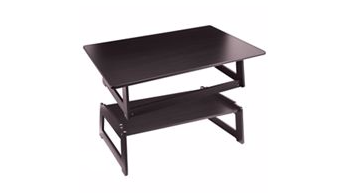 I have always wanted an adjustable height table for the living room it would be so perfect for our weekly game nights! Thanks for sharing I will definitely be looking into one step ahead! Sua agrupamento se sobressai com atitude alterado. De pé, separe as pernas até a largura dos ombros.